St. Beauty is a duo made up of Alex Belle: lead vocals, and Isis Valentino: background vocals, guitar and bass player. Both originally from Atlanta, GA.
Alex Belle, 19, played lead roles in musicals in high school, “Once On This island” and “Speak, I’m listening.” Alex brings honest and personal lyrics dealing with relationship issues. Her melodies are haunting and linger in the melodic minor. 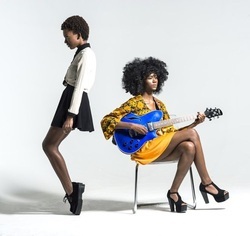 Isis Valentino, a member of the Wondaland Arts Society and a former dancer for Janelle Monáe can be seen with St. Beauty lending her soothing vocals and delicate talents on guitar. Alex’s lyrical melodies combined with Isis’ chordal progressions and her minimalist approach to guitar and bass creates an overall soothing yet haunting blend of soul, folk, rock, and tribal music to the sound spectrum.